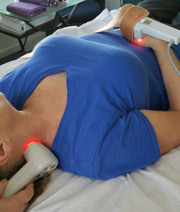 Cold laser therapy offers an array of relief. Imagine the surprise when researchers learned that certain light frequencies could actually reduce inflammation and enhance the healing process! Fairfax Chiropractic has cold laser! And has invested in 2 emitters. Most clinics purchase only 1. When patients learn that we use laser therapy in our practice, they have visions of a powerful, steel-cutting beam of light. The “cold” laser we use has only a tiny fraction of the power. Instead, its value comes from the frequency of the light it emits, not its intensity. It is like the “flash” in a camera when you think of it. Instead of the full spectrum of light that comes from the sun, our low level laser produces light in a narrow frequency. Frequencies in the red portion of the rainbow are shown to assist the healing of soft tissues. Apparently, cells of our body have receptors that are sensitive to light. Our lasers penetrate up to 5 inches of tissue and are used by major sports leagues. 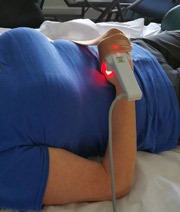 We have lots of patients receive acupuncture and then ask for Cold Laser on the same day. Please make an appointment for both if you like.